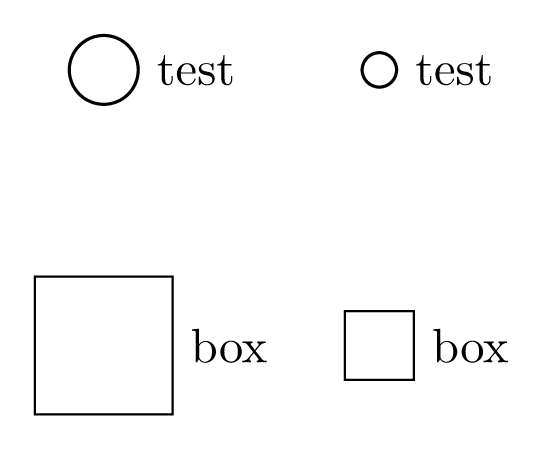 we can clearly see that a) the nodes seem to be positioned correctly, the appear like there is a 2cm distance between them, as expected; b) the size of the left two nodes is wrong - I would expect the left two nodes to have the same size as the right two ones, but this isn't the case. because I want the node sizes be relative to the node distances and relative to each other. If I would use absolute widths and heights within the style definitions for the nodes, this would be rather unflexible, so I wonder whether it is possible to set the length of "1 unit". You can define a style unit length that sets a custom length \unitlen usable later in your drawings. I set the default length to 1cm in the following code. The x=1cm and y=1cm are used only for coordinates without units, not for lengths. 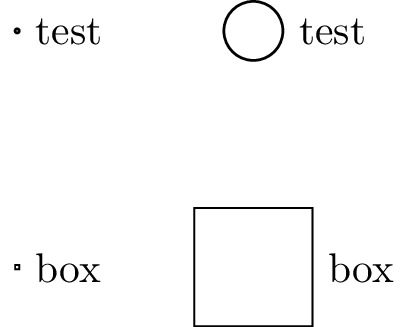 Another solution is to pass a parameter to your box and test that is a length, with default value of 1cm. Can I calculate the difference between two relatively positioned nodes with TikZ using calc?